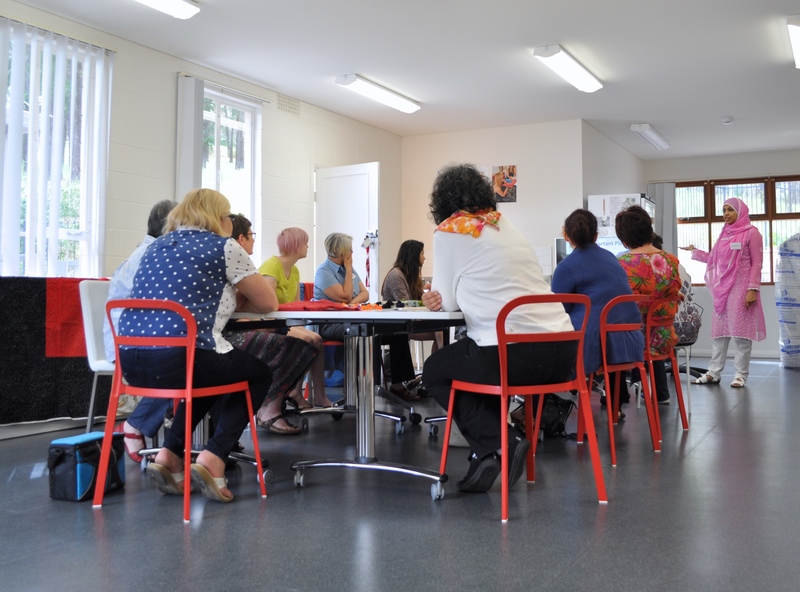 Our workshops and events are facilitated by highly skilled professional artists who have a passion for working with people with diverse backgrounds, skills-base and interests. They offer members of our community and the broader public opportunities to learn and gain new creative skills in an open, friendly and supportive environment. Guided by John who combines a range of drawing materials, you will explore simple techniques for drawing a plein air. Working outside you will learn how to observe, study and record aspects of the natural and built environment. John will also demonstrate a variety of methods such as grid drawing, perspective, proportion, tone and shading. By the end of the day you will have created your own colour or black and white study. Note: A significant proportion of this workshop will take place outdoors. In case of severe weather workshop will take place indoors. This workshop is associated with The Shed 26, South Australian Company Stores Series. An exhibition by John Whitney. Concludes 27 April. Image: Floral sculpture is by Jane Bailey and is indicative only. Creative outcomes will vary and are dependant on participant skill level. Are you fascinated by your dreams and impressions they leave you with? Why not explore this this landscape using poetry or prose to unlock their imagery, symbolism and narratives. Amelia, whose most recent poetry collection Dreamday responds to artworks about dreams and dreaming, will provide a supportive creative environment for you to delve into this inner world. This workshop is a cross art-form extension of Gallery 1855’s exhibition A Doll That Phyllis Never Gave Me. A response to a disturbing dream about a doll. Created by visual artist Catherine McAvoy. Concludes 27 April. The jewellery we wear can be an expression of our emotions and unique identity. With Sahr’s guidance you will explore this idea, while focusing on how the objects we acquire carry a sense of connectedness and familiarity with the world around us. Thinking about ‘home’ and ‘identity’ you will design and make your own brooch or pendant. Using simple jewellery and paper construction techniques, your unique piece will be intimate and reflective of your creative exploration. Image is indicative only. Artworks produced on the day will vary. Over 2 days Illustrator Sally Heinrich will guide you through the process of taking your story from words on the page to an illustrated concertina book. Beginning with character development and initial sketches, you will plan a storyboard, complete your illustrations and finally construct your book. We will also look at how specific elements in illustrations create a visual language that extends and complements the text. Bring along a story, poem or song lyrics to illustrate and anything else that may relate to your story. 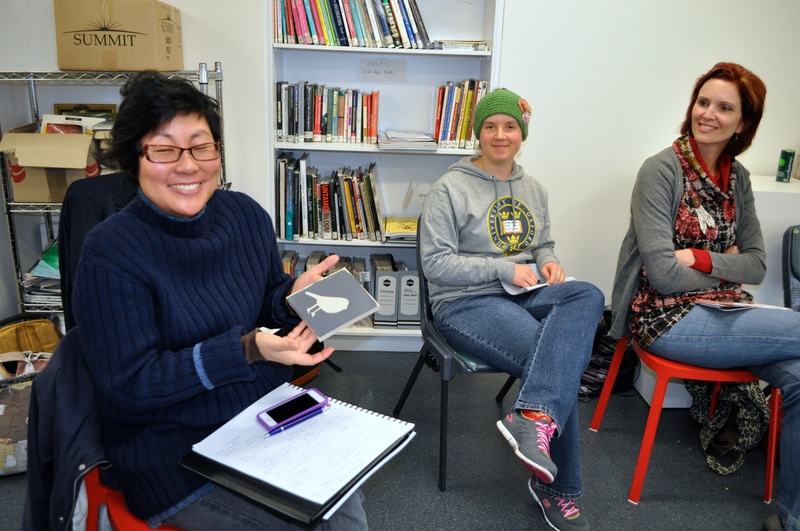 This 2-day workshop coincides with Gallery 1855’s Fringe Festival exhibition Décalage, curated by Sally Heinrich and opening 3 February 2019. Images: Illustrations are by Sally Heinrich and are indicative only. Creative outcomes will vary and are dependent on participant skill level. Bring your young ones along for a talk and tour of our Fringe Festival exhibition Décalage, followed by morning tea. Also hear how Danny and Sally successfully integrate parenthood into their creative careers. This event is designed for parents and caregivers of infants and young children. 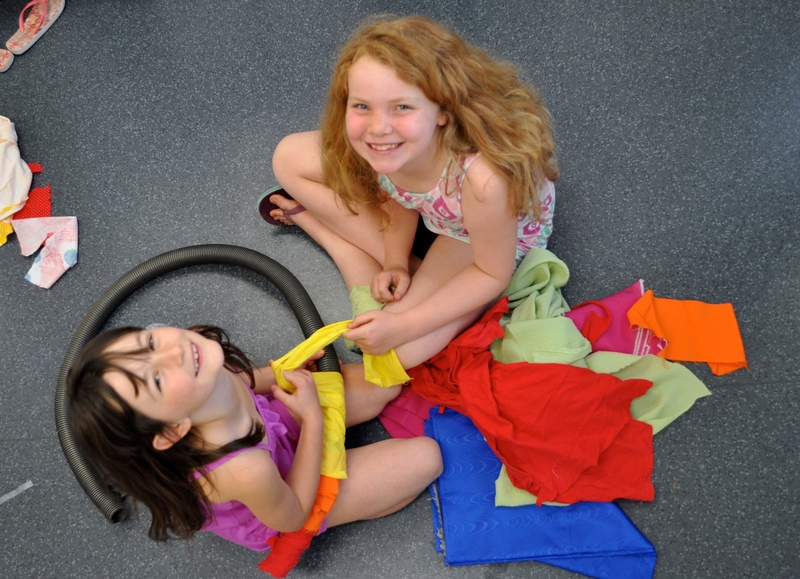 A craft activity will be offered to pre-school children attending this event. Image of lanterns made by Michelle Jahn is indicative only. Creative outcomes produced on the day will vary. 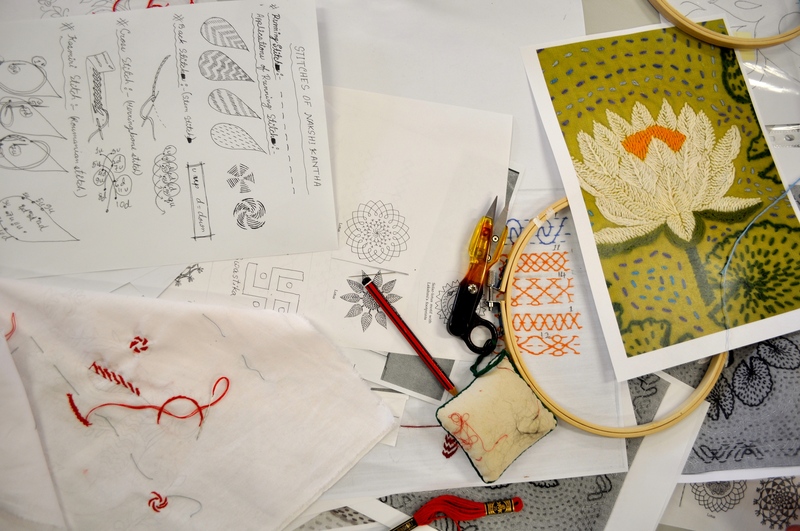 Images above: Participants create their own templates using cut out motifs from decorative papers. James Parker demonstrates how to mix paint colours and the type of effects which are possible to achieve in your prints. and Japanese paper that you have stained with pigments. 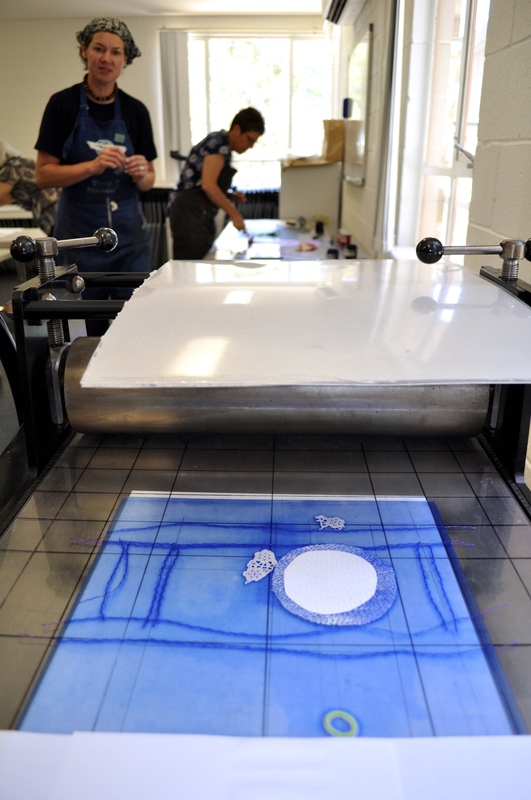 Images above: James Parker sets up the press and then removes a finished print. Images above: Some examples of student’s work. The festive season is approaching! In this fun workshop you will experience the magic of paper cutting with Ellen Schlobohm of Ellen Marie Artistry. You will finish the afternoon with a least one beautiful and intricate paper-cut wreath created from white and coloured papers. Hang it on a door, in a window or even on a tree. Make your wreath using templates provided by the facilitator or from your own design. Suitable for participants 16 years and over. No previous papercutting skills required. 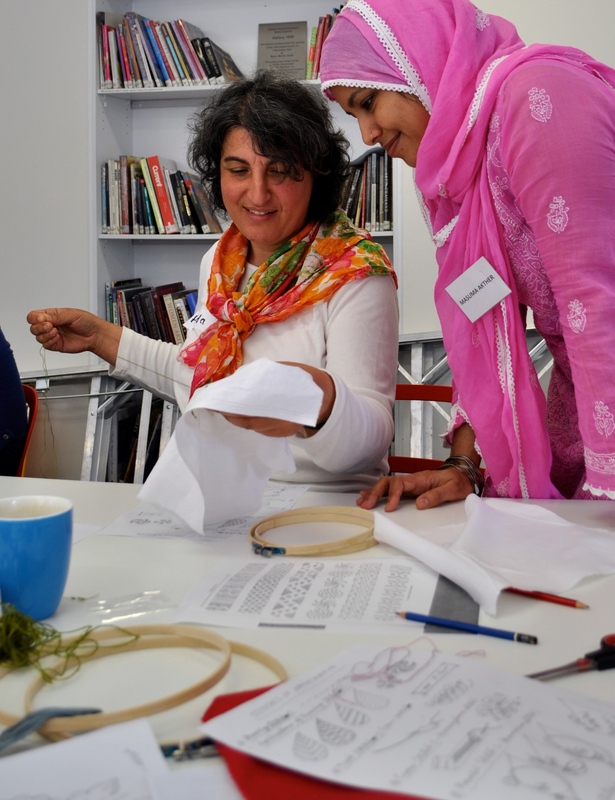 Images: Participants at the workshop interpreting a traditional Christmas symbol as a papercut wreath. ‘Drawing upon…(live)’, followed by morning tea. Hear how Melanie Fulton visual artist and curator of this exhibition integrated parenthood into her creative career. Images above: Mothers, grandmothers and young children enjoyed a tour of the Gallery, led by artist and exhibition curator Melanie Fulton. Melanie also spoke about her experiences mixing artistry and motherhood. Guided by Melanie who combines visual art with her floristry practice, you will explore simple techniques for drawing flowers and plants. Looking at flower and plant shapes, along with growth patterns, you will discover how your drawing can take shape. Melanie will also explain the differences between scientific botanical illustration and artistic or decorative drawing. by the end of the day you will have created a study of a flower or plant. Who: Suitable for people 16 years and older. No previous drawing experience is required. Painter, Scott Rathman will work with participants to explore connection to place through the use of colour, symbols and pattern. Scott Rathman, Someday at the River, acrylic on canvas. 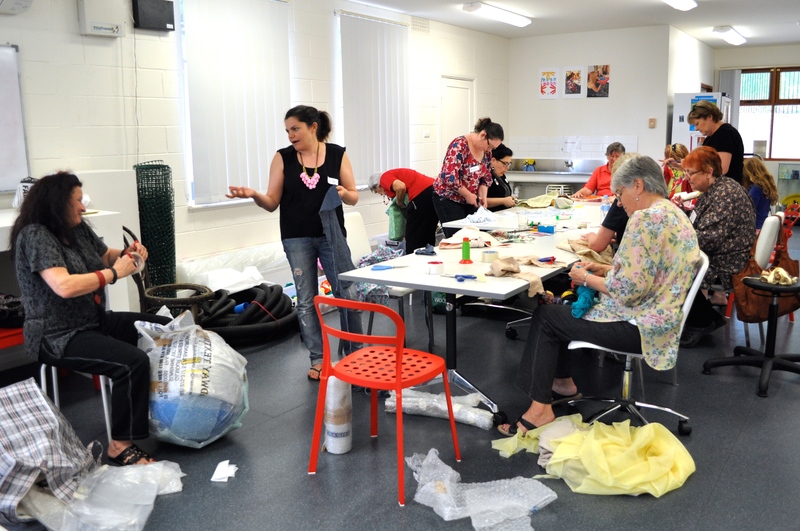 The group will work together to design and paint readymade seating cubes that will be displayed and utilized in Modbury’s Civic Park during NAIDOC week 2018.
exhibition Some Identity: who are you? by Scott Rathman. contemporary twist. 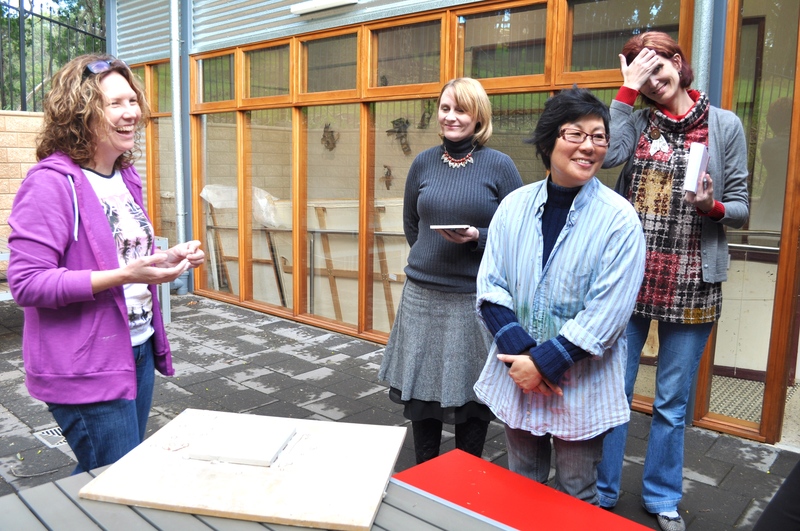 Participants can bring their own selection of objects to work with. Bricolage is borrowed from the French word ‘bricoler’ – to tinker. Simply put, it refers to art work created from a diverse range of found objects. Images above: Facilitator Maggie Moy guided participants in bringing their hybrid creations to life. Images above: Some of the amazing works produced at the Bricolage workshop. Inspired by Vesna’s artworks in The Doll Redefined exhibition you will create your own unique Babushka doll. Images above: Participants enjoyed creating their own unique crocheted dolls in the style of the traditional Russian Babushka (granny), in this workshop facilitated by Vesna Petiq. drawing and colour theory, while other levels are supported in their own project of choice. You will explore different methods and techniques for each media. Cost: $155 for the 9 week course. Materials: list provided upon request. 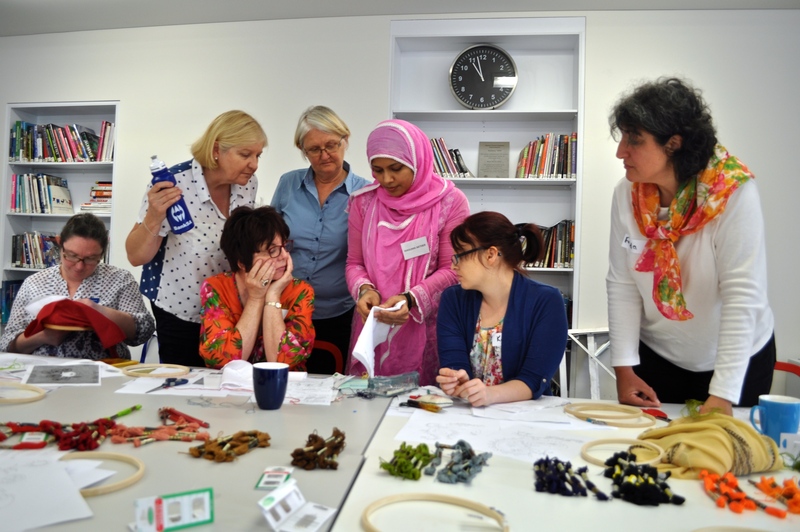 Guided by jeweller Sue Garrard, you will create pendants using two bead making traditions. You will recycle everyday materials such as soft metal, paper leather and fabric into contemporary jewellery. The tradition of paper bead making began in Victorian England in the late 1800’s. Recycled paper bead making also has a long history in Africa. 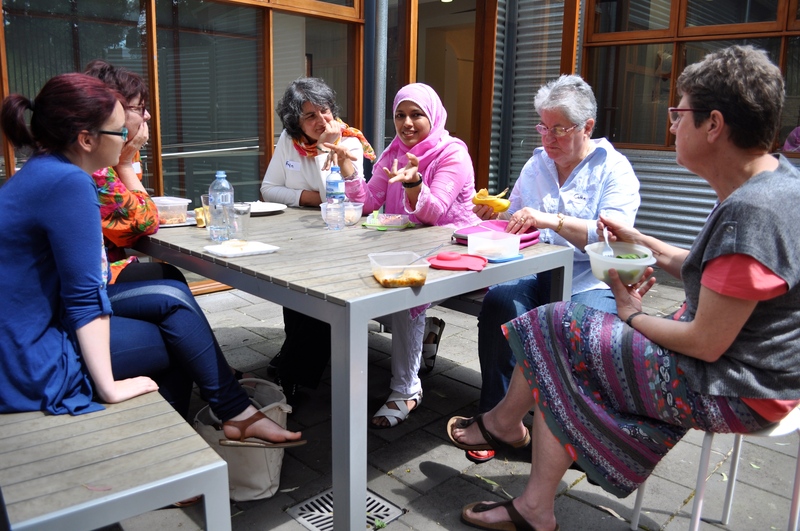 It plays an important role there today as a source of income for women, enabling them to create micro-businesses that help support their families. 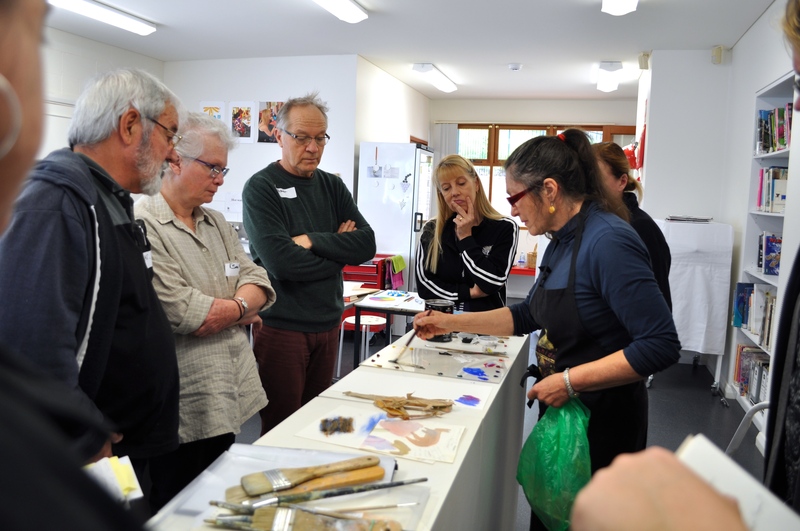 Images above: Sue Garrad guided participants through the meticulous process of making paper and tin pendants. Using an assortment of discarded materials, community members contributed to the design, production and installation of one large-scale artwork on our fence. 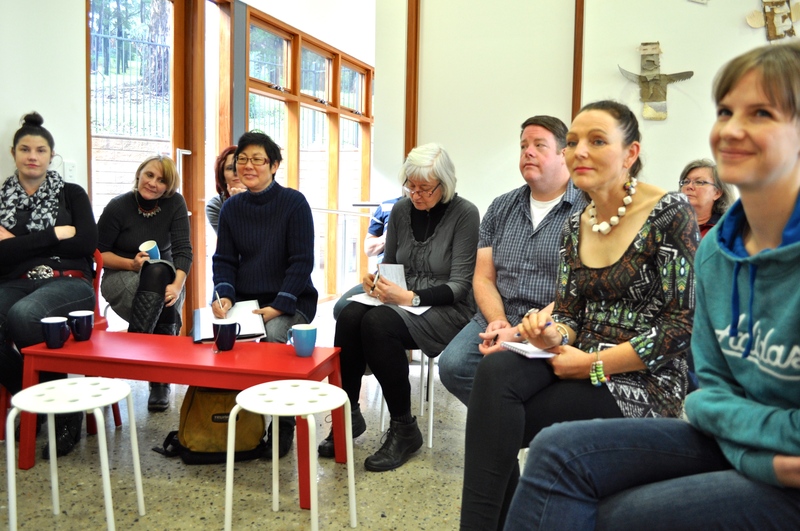 This participatory project coincided with Gallery 1855’s Fringe Festival exhibition ANEW by Jane Skeer. Images above demonstrate participants assembling and choosing materials, planning a design and construction of the Fence Work project. When: 10am – 2:30pm, Wednesday 6 September 2017. Step by step guidance through all the technical aspects involved in creating a ceramic pot, full of personality and ready for firing by the end of the workshop. When: 10am – 2:30pm, Wednesday 23 August 2017. Indigenous Foods Presentation , Tasting and Guided Tour. Identification of edible plants, collection and preparation techniques. Presenter: James Tylor, an Australian artist and photographer who examines racial and cultural identity in Australian contemporary society. When: 12-4pm, Friday 2 June 2017. Introduction to a variety of printmaking and drawing techniques by No Bridge Too Far Artists James Parker and John Whitney. Including the creation of hardboard portfolios to contain the creative outcomes. When:10am – 4:30pm, Sunday 28 May 2017.
Who: beginners – intermediate skills base. No Bridge Too Far Artists James Parker and John Whitney shared insights into the South Australian bridge as a landmark and anchor for identity and place. When: 5:30-7pm, Sunday 28 May 2017. DECORATE IT (ceramics workshop). Introduction to surface decoration and treatments (decals, sprigging, slip trailing) with Anna Couper. When:10am – 2pm, Saturday 18 March 2017. ARTIST TALK BY PHILIP HART. Covering Phil’s ceramic practice, including the development of his ideas and material processes. When: 3-5pm, Saturday 18 March 2017. We learnt how to create bright and funky ceramic figures with Hills Edge Clay artist Alison Smiles. Using terracotta clay we hand built and surface decorated our own creations over two fun sessions. When: 4:30 – 8:30pm Tuesdays 21 and 28 February 2017. Where: Gallery 1855 Studio (2 Haines Road, Tea Tree Gully). We made a mini decorative wreath and other intricate pieces with paper cut artist Ellen Marie Artistry. Ellen also explained and demonstrated different paper cutting approaches while guiding us through each step of the process. When: 10:00am – 1:00pm and 1:30 – 4:30pm, Saturday 26 November 2016. We learnt to make paper with Catherine Hewitt (paper artist). Using recycled materials, we made different textured and colours papers (some with pressed flowers and seeds) that we later used for cards, artist books and other purposes. When: 10:00am – 12:30pm and 1:30 – 4:00pm, Saturday 29 October 2016. We created our own layered designs and printed them onto a calico bag with Tooth & Nail’s very own Jake Holmes. Presented by CTTG Youth Development. When: 10:00am – 1:00pm 27 September 2016.
Who: For aspiring young creatives (15-25 years). Cost: $5 (all materials and equipment supplied). 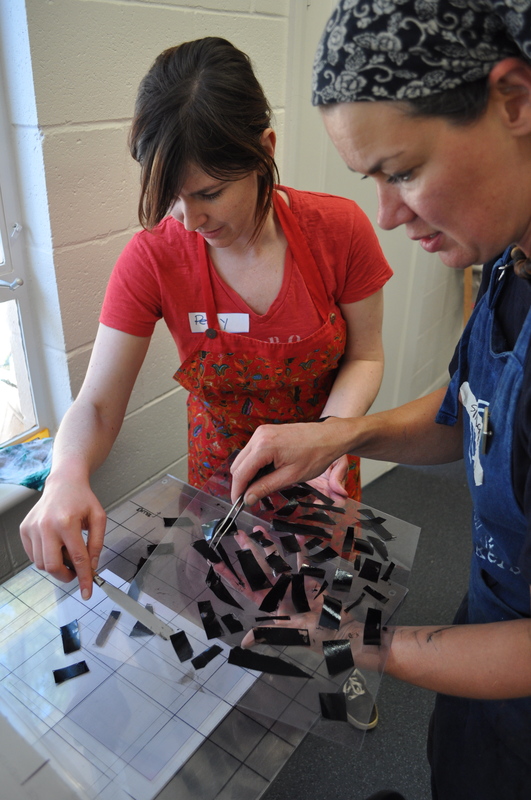 We learnt to make paper and glass lanterns with mixed media artist Catherine Hewitt. 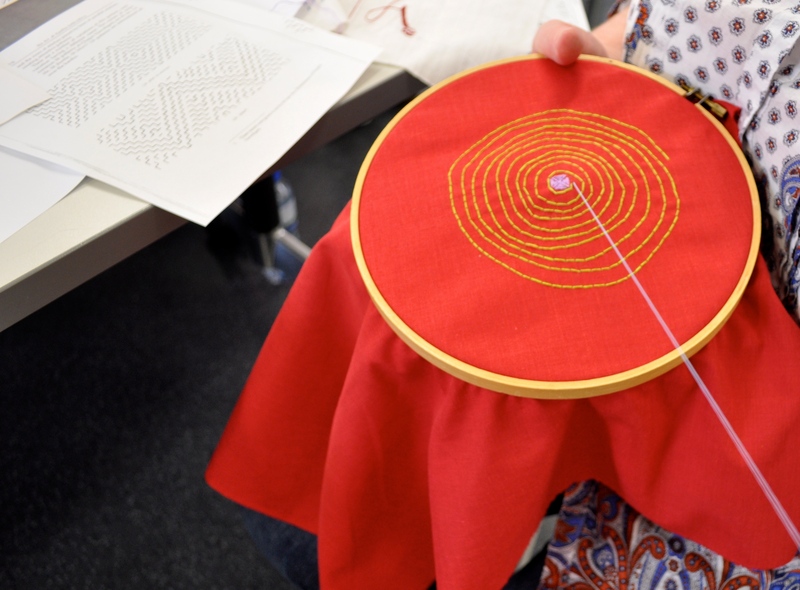 Catherine guided us through basic design and layering techniques to create our very own luminous lantern. When: Two workshops 10:00am – 1:00pm & 1:30-4:30pm, Saturday 27 August 2016. 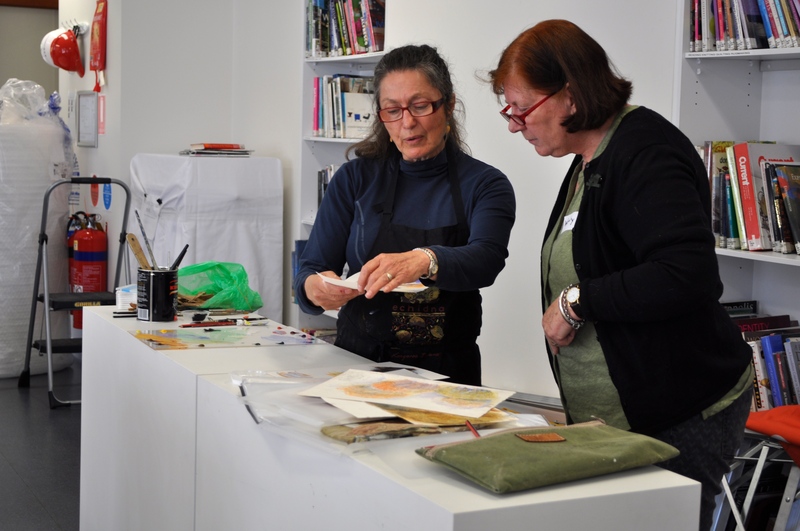 We learnt to make simple artists books by cutting, redacting, gluing, stitching and repurposing magazines and other printed ephemera with Barbara Coddington (writer and artist) and Simone Tippett (print artist). Presented as part of the Print Council of Australia’s 50th Anniversary celebrations and the 2016 Year of Print. When: 10:00am – 4:30pm Saturday 25 June 2016. 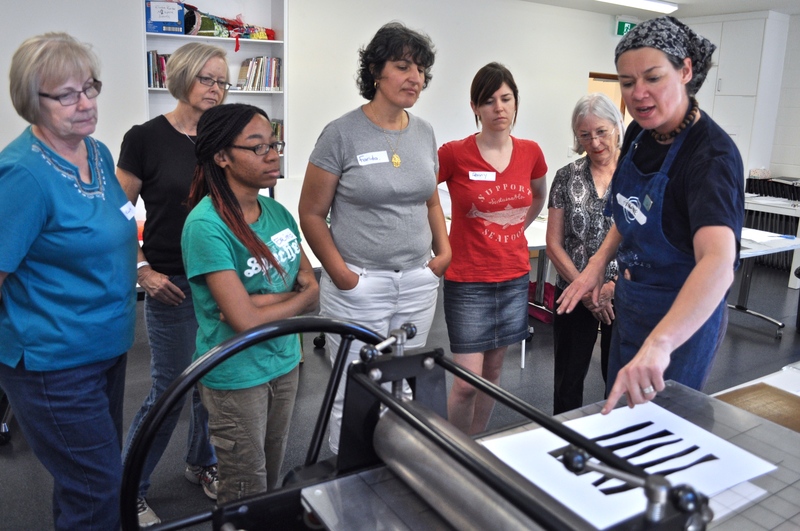 Participants created their own layered designs then screen printed them onto their own cotton tea towels with Jake Holmes from Tooth and Nail Studio. Jake guided them through all the basics, so they could achieve their own set of tea towels. When: Two sessions on 15 June 2016. 10:00am – 12:30pm and 1:00 – 3:00pm. 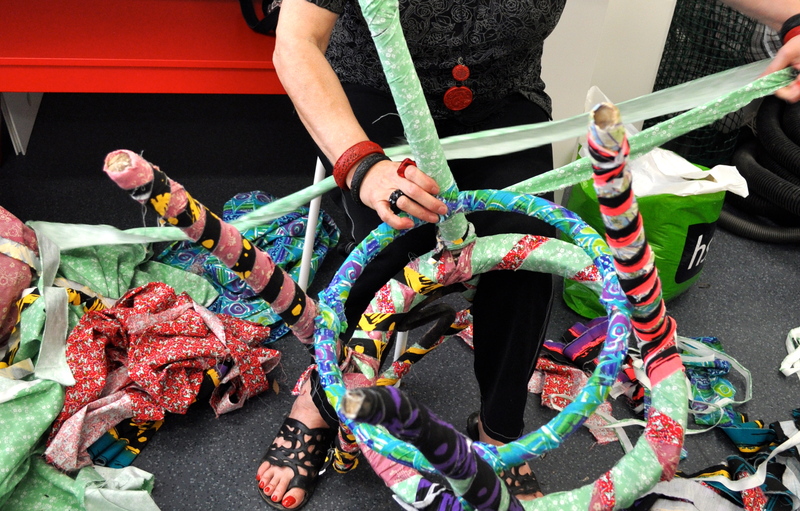 Where: Workshops at Gallery 1855 Studio (2 Haines Road, Tea Tree Gully). When: Workshop 1, 17 and Workshop 2, 24 May 2016. Both workshops 10:30am – 2:30pm. Artwork installation, 31 May from 12noon – 4:00pm. 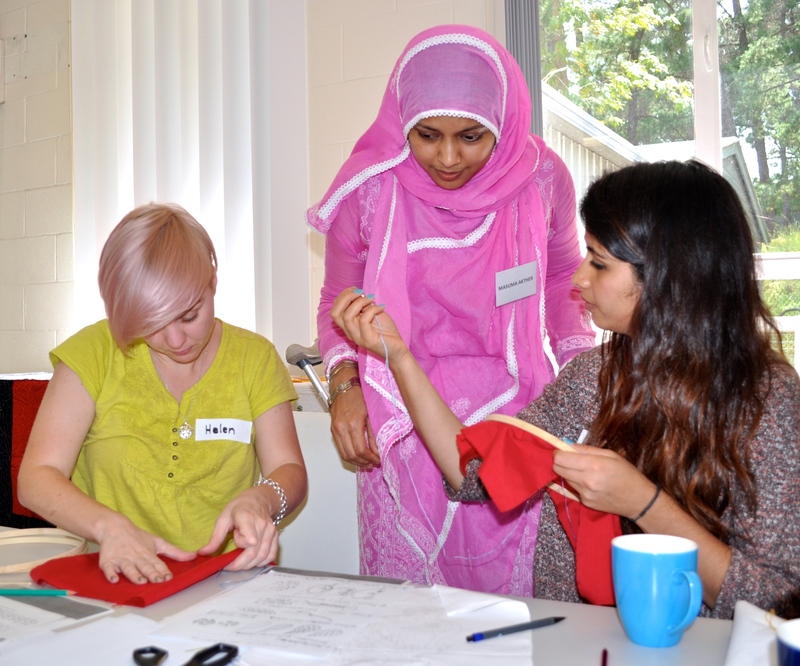 Who: Young creatives who are interested in public art, and developing craft and design skills. Aged from 15 – 25 years. Jessamy is a contemporary jewellery and object designer/maker with a broad practice which includes community art and small public art projects. Exploring the design concepts of architects Daniel Libeskind, Peter Davidson and Donald Bates, she has been interpreting their philosophies through her own practice as a contemporary jeweller, whilst taking visual inspiration from patterns and repetition found in both the natural and the build world. Her aim is to incorporate all functional elements within my designs to ensure each forms independence as a sculptural object from its function as jewellery. Inspired by architecture, her miniature sculptures will provoke you to shrink with in your imagination and explore the forms internal spaces at an architectural scale. In 2011 Jessamy completed the two year associate program in the Metal Design Studio at JamFactory, and received a Master of Arts Practice through Charles Sturt University in 2012. 2013 was an exciting year for her practice; coming runner up in Contemporary Wearables and winning the Gold and Silversmiths Guild of Australia Award in the Contemporary Australian Silver and Metalwork Awards. In 2014 Jessamy was named as a finalist of the National Contemporary Jewellery Award where she won the Courtesy of the Artist prize. 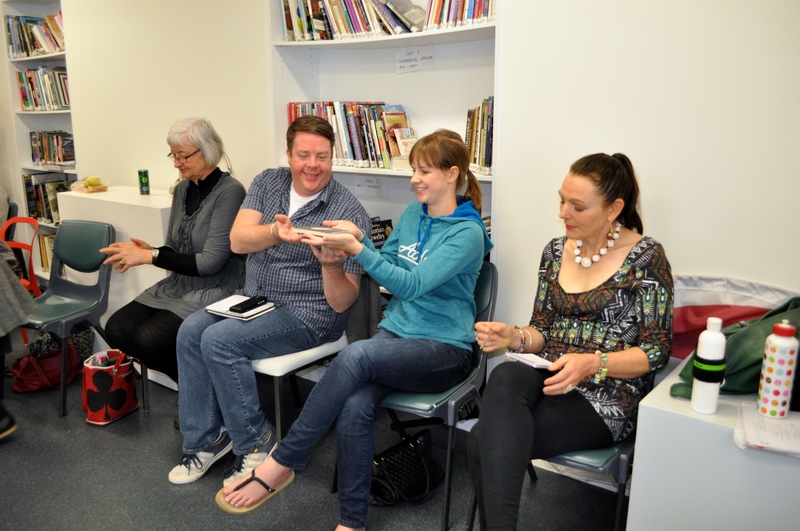 She was also lucky enough to participate in Adelaide City Councils ‘Community Arts in Place workshop’ were she received mentoring by Cindi Drennan and Sandy Elverd. 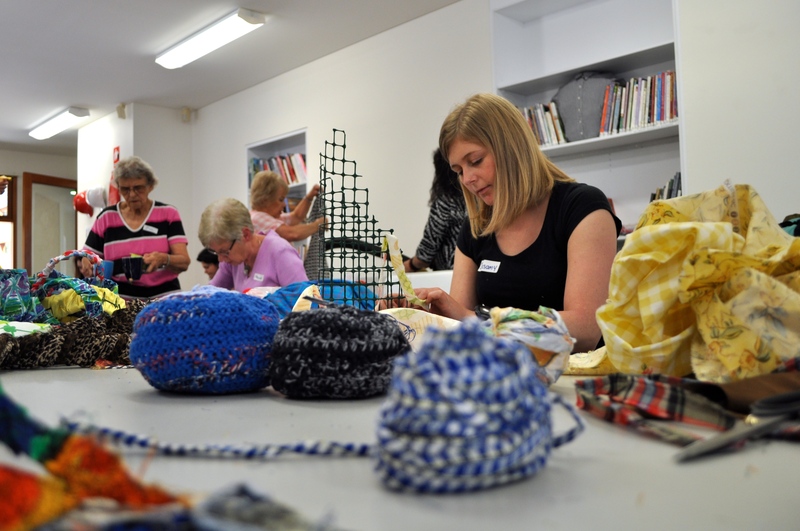 This was a valuable experience which has reinforced her passion for community art and provided her with some amazing experiences within the local community. 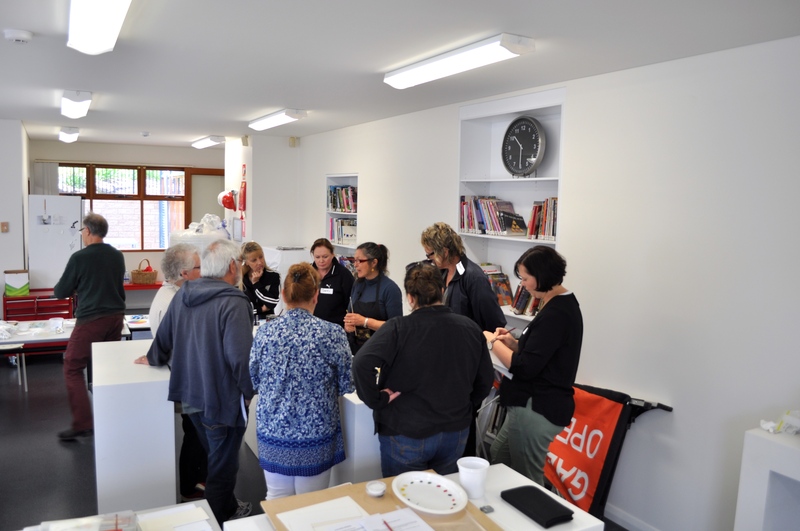 Jessamy teaching jewellery making to local community members at Gallery 1855 Studio in 2015. For young creatives who want to get their heads around planning and running their own market stalls. 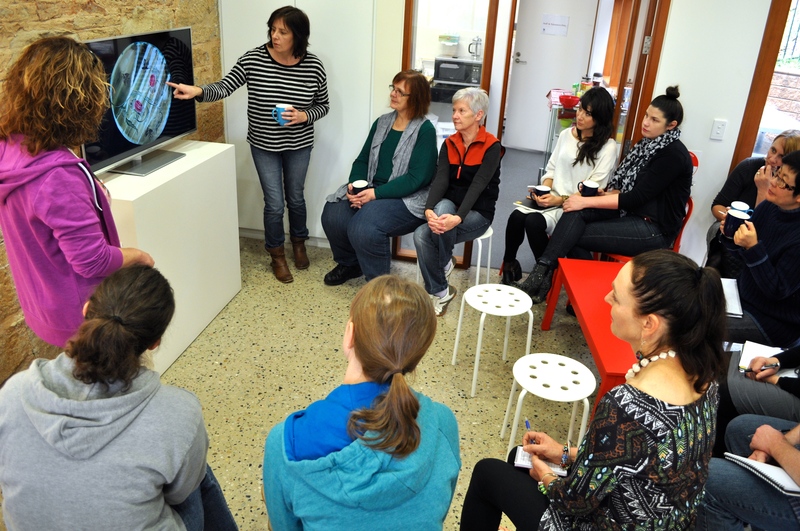 An exhibition tour and morning tea for parents and carers with babies and young children. Attendees also heard how ceramic artist and mother of four Sunshine March balances an arts career with parenting. Participants made a variety of bowls using slab building surface decorating techniques. Presented as part of Hills Edge Clay exhibition. 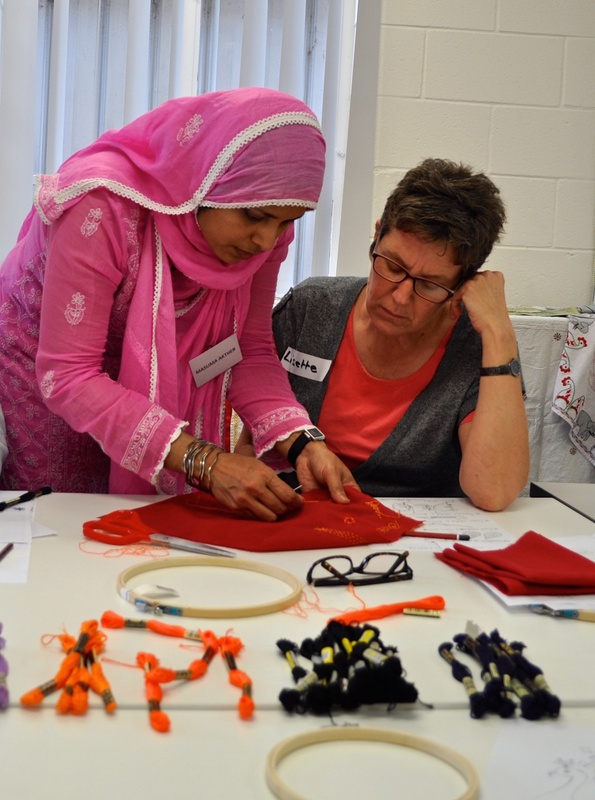 Participants learnt the embroidery stitches and celebratory motifs depicting aspects of life in Bangladesh alongside experienced maker Masuma Akther. They created their own embroideries using the stitch techniques taught by Masuma over two workshop sessions (totalling 10 hours). 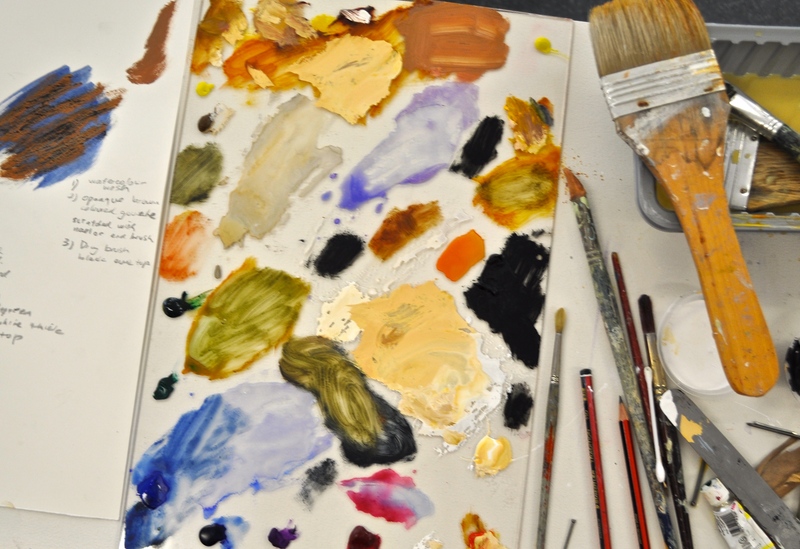 Working from Still Life subjects participants experienced the freedom that the incorporation of opaque white gouache allows when creating your own watercolour paintings. 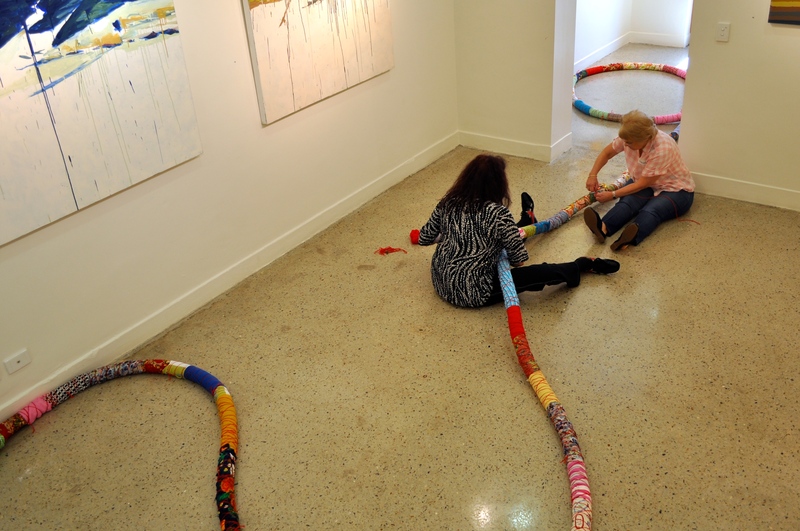 Kangaroo Island based artist Jenny Clapson was a participant in Gallery 1855’s exhibition Ecologies of Place. Her creative practice spans over 40 years where she has worked and taught in a number of mediums, significantly printmaking, watercolour and gouache. Her paintings and prints are held in the National Gallery, Art Gallery of South Australia and Parliamentary House collections. 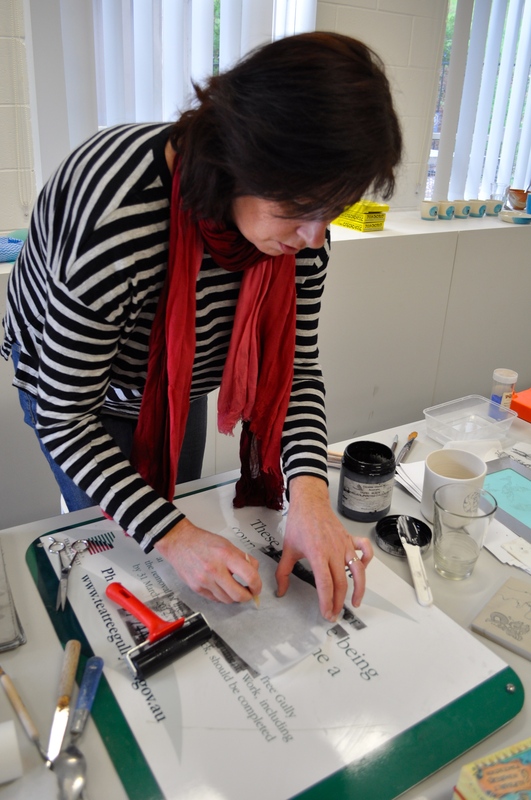 Mark making on clay – learn to surface decorate clay tiles with ceramic artist Angela Walford. 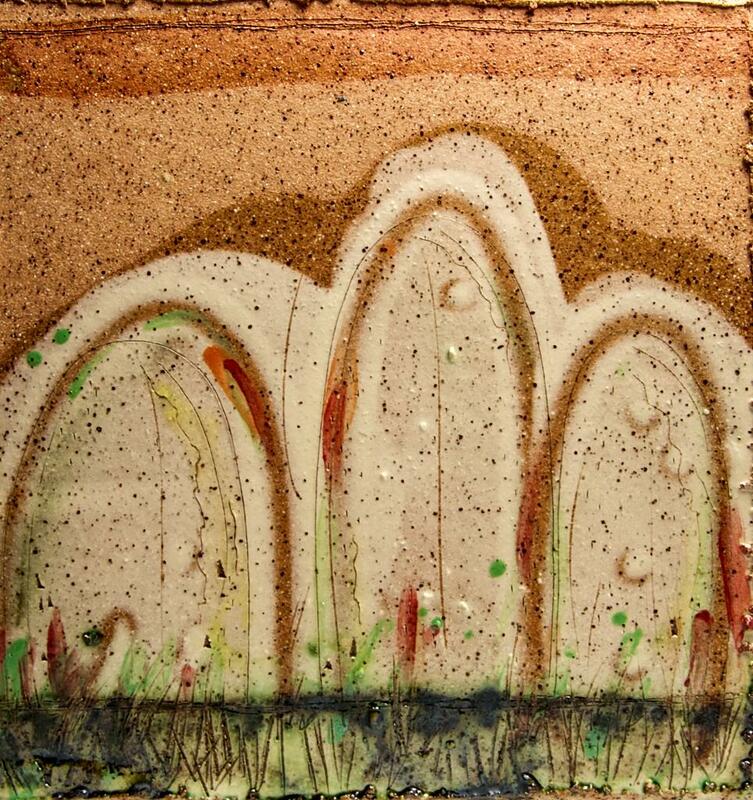 Angela Walford, Hills Landscape, 2014, stoneware clay, slips, oxides, 30 x 30cm. Image Courtesy of the artist. 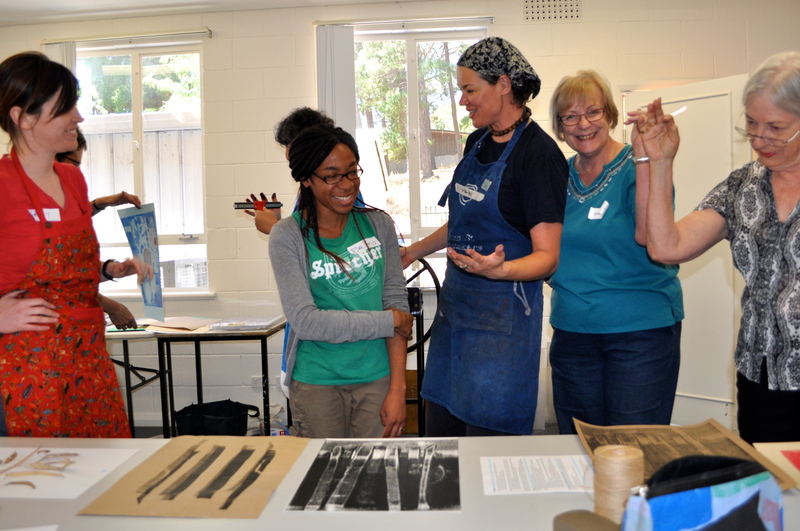 Professionally led by print artist Simone Tippett, these two print making workshops encouraged community members to think differently about waste, and to change behaviours around the accumulation and disposal of waste. 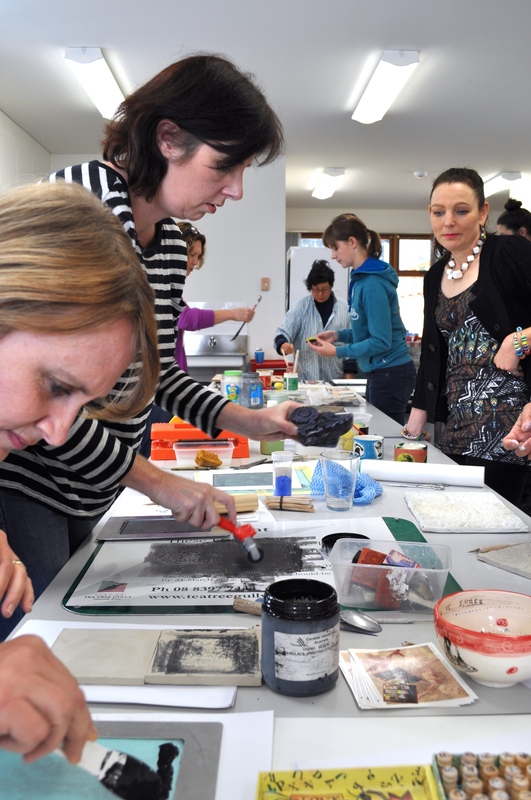 Participants used a range of everyday waste products to create collagraph prints. They were asked to think about their daily activities, about the waste they accumulate on a day-to-day basis, and also creatively interact with safe-to-use waste…to think about how to use waste creatively. 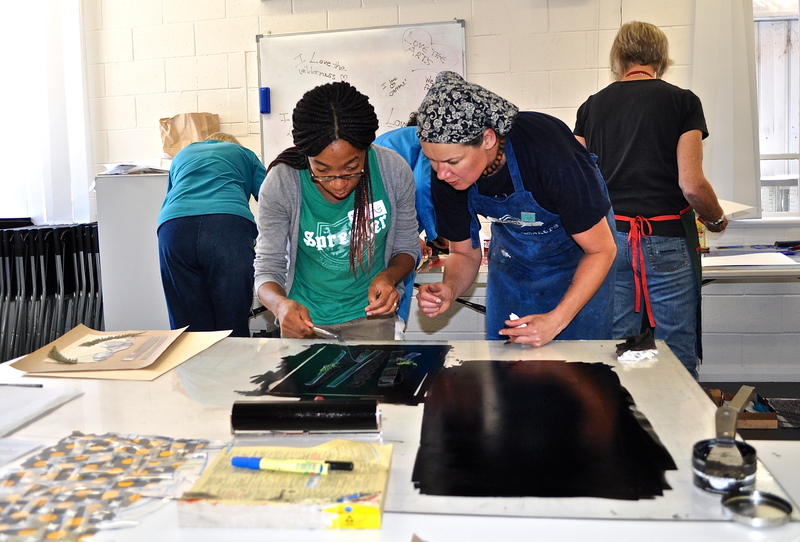 By using the collagraph printing process, community members worked (touch, manipulate, repurpose, cut, etc) with waste materials. 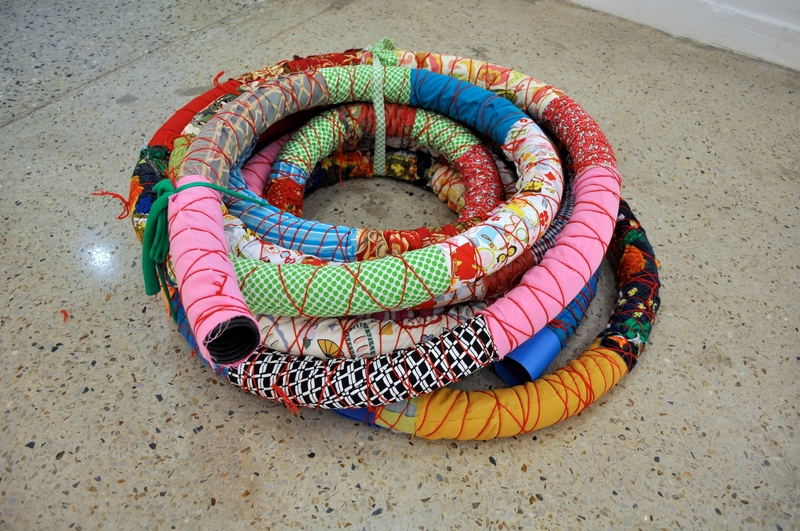 The resulting prints were exhibited during the 2014 Fringe Festival at the City of Tea Tree Gully in 2015. 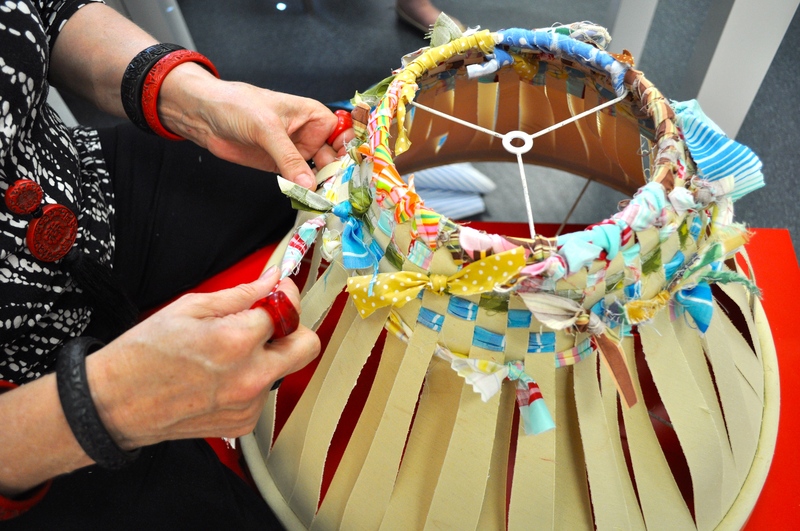 An environment sustainability awareness building workshop series using waste fabric and other home wares. Guided by Annabelle Collett participants worked through many processes and techniques to make an outdoor ephemeral textile installation which was placed in the adjacent park near Gallery 1855 at Tea Tree Gully. 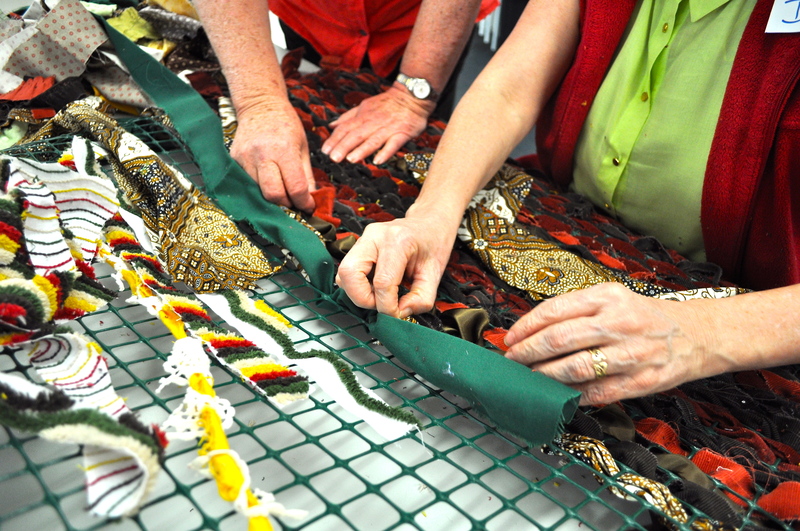 Participants used a variety of waste fabrics (old clothes, bed linen, T towels, table clothes, fabric scraps, rags, irrigation hoses and other plastic). They cut them up, ripped, plaited, stitched, knitted, remade and transformed them into a new life. Ceramic artists Angela Walford and Alison Arnold demonstrate printmaking techniques for ceramics. From creating a screen using a Gocco machine to low tech techniques including lino printing. Learn how to transfer an image on to flat and curved forms and create rich surfaces using layered decoration techniques.